A rare gustnado has been captured on camera sweeping across south east Queensland shortly before a thunderstorm left a trial of destruction on the way to Brisbane. Storm chaser Jamie Nicol filmed the wind swirl spinning dust across farmland, on the Darling Downs, as a supercell storm moved towards the coast on Saturday afternoon. 'Gustnadoes of this size and strength are rare, they are formed by strong downdraft winds on the leading edge of a thunderstorm,' he said. 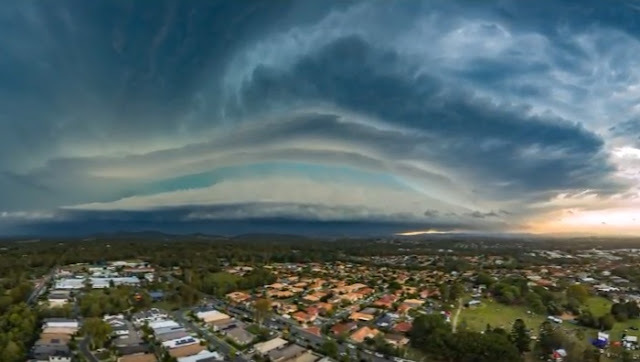 This 400-metre wide gustnado was videoed near the town of Clifton at 4.30pm, about half an hour before hail rained down on Brisbane, about 150 kilometres away. It had an estimated wind speed of 120km/h, downing trees as it damaged crops and road signs. A short drive away at Allora, a teenager sustained an electric shock from lightning as he held on to a metal front door. The 17-year-old boy was treated at home and wasn't taken to hospital, Queensland Ambulance Service spokesman Michael Augustus said. 'The door was struck. He received a shock through his body,' he told Daily Mail Australia. More than 35,000 homes lost power as a result of the super storm but Energex had restored electricity to most its customers by Sunday afternoon, with 744 without power by that time. 'Our crews worked tirelessly through the night to get our customers up and running,' spokeswoman Karen West told Daily Mail Australia. 'A lot of the damage was due to trees and high winds around 74km/h.' Senior Bureau of Meteorology forecaster Sam Campbell, said there had been structural damage to homes in the Lockyer Valley and towards Brisbane. 'We have some top-end supercell thunderstorms and we have reports of roofs removed at Gatton, swift water rescues at Salisbury in Brisbane,' he said. Flights at Brisbane airport were delayed, stranding boarded passengers in aeroplanes on the tarmac as the storms hit the city at 5pm. Images flooding social media showed golf-ball-sized hail striking homes at Rathdowny, near the NSW border. In inner-city Brisbane, a crane was seen spinning from the wind and at moments throwing sparks. The severe storms also hit the Sunshine Coast.